In the past few decades, ziplining has become one of the most popular vacation activities in the nation! While we are thrilled to see zipline tours getting so much attention, unfortunately, there are still a number of pervasive, misinformation-ridden myths circulating about ziplining. Here at CLIMB Works Keana Farms, we want to set the record straight. 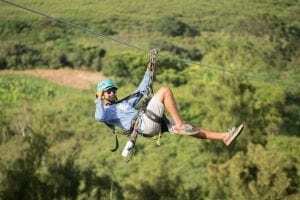 Below, you will find five of the most common myths about ziplining in Oahu and the truth about each misconception. The most common myth about ziplining is that it is unsafe. Of course, if a disreputable company is running a ramshackle operation in the middle of nowhere without proper oversight, ziplining there would be dangerous! However, if you take a zipline tour with a trusted provider, like CLIMB Works Keana Farms, you have absolutely nothing to worry about. At CLIMB Works, safety is our #1 priority. As an industry leader, our course exceeds the standards set by the Association for Challenge Course Technology and the American National Standards Institute. For more information, read our in-depth article about how we keep you safe at CLIMB Works. Another prevalent myth about ziplining in Oahu is that it is just for daredevils. This is an understandable assumption to make. Whizzing above the treetops at 30 miles per hour is indeed a thrilling experience! Nevertheless, you don’t have to be an adrenaline junkie to enjoy a zipline adventure. In fact, many of our guests at CLIMB Works have a fear of heights. With a little encouragement from our guides, these guests are able to overcome their nerves and have a fun experience soaring through the sky. If you’re still a bit nervous about ziplining, check out these 5 tips for conquering your fear of heights at CLIMB Works. While it is possible to get stuck on a zipline, you don’t have to worry if you do get stuck at CLIMB Works Keana Farms. At some zipline courses, guests are required to hand-brake by grasping the zipline cable with a gloved hand. If the rider gets overly excited or nervous, they may grab the cable too early and find themselves stuck in the middle of the line. At our zipline course, we use a top-of-the-line ZIPKEA braking system that eliminates hand-braking, making it safer for riders. Fortunately, guests at CLIMB Works don’t have to worry if they do happen to get stuck on our lines. On the rare occasion that it does happen, you don’t have to do a thing. Our experienced guides will take care of the situation! They’ll come and pull you in right away. You weigh under 270 pounds. You can stand on your feet for 3 hours. You can walk for a ½ mile on even terrain. You don’t have a medical condition that requires immediate attention. You haven’t recently had major knee, back, or leg surgeries and don’t have any injuries. Because it is an adventurous activity, many people believe that ziplining is just for young people. However, that couldn’t be further from the truth. Here at CLIMB Works, we recently hosted a couple of friends in their 80s who had an absolute blast ziplining with us! As long as you meet the physical requirements detailed above, our ziplines are open to anyone over the age of 7. Now that you know the truth about ziplining in Oahu, it’s time to book your tour at CLIMB Works! You can reserve your zipline adventure by clicking here.